Please note that Luther and the Reformers wanted to be “seen” in only place at the foot of the Cross in adoration of Jesus Christ as Luther points to the Bible which pointed them and points us to the Lord. This is the way Martin Luther, a scant 3 years after he posted 95 Theses thought about them. His 95 Theses were too ROMAN Catholic, not adhering and agreeing to the clear Word of Bible in regards to say, purgatory. They were not truly catholic which means not Biblical. “Catholic” literally means “according to whole”, the whole of God’s Holy Word. It is historically incorrect to say that on October 31st, the Church was reformed. It may have begun but the real reformation of the holy, catholic and apostolic Church began on June 30th, 1530 when the princes and electors presented to His Serene Majesty, Emperor Charles V, The Apology of the Augsburg Confession. They, that is the princes and electors along with the confessors of the Faith, Luther, Melancthon, et. al., did not reform the Church: The Word of God alone did that, does that and will. Our calling is to preach and teaching His Word as clearly as possible. On this day, we celebrate all together too much one man, Martin Luther. If you want a fuller article on my appraisal of this day, please read my article Ad Fontes! Doctrine at Brothers of John the Steadfast. What was all the fuss about back in the 16th Century that caused a schism? Answer: Justification. On this day, justification by grace had not been spelled out. The Lutheran Confessions is why I am a Lutheran and also a catholic. The Confessions contain Luther’s Small and Large Catechisms which are to be prayed: The Ten Commandments, the Apostles’ Creed, the Lord’s Prayer, Holy Baptism, Confession and Absolution, Holy Communion, prayed, meditated upon, taught, in response to Jesus Christ so we may be still and receive His Word for the strengthening of faith. Our churches also teach that men cannot be justified before God by their own strength, merits, or works but are freely justified for Christ’s sake through faith when they believe that they are received into favor and that their sins are forgiven on account of Christ, who by his death made satisfaction for our sins. This faith God imputes for righteousness in his sight (Rom. 3, 4). The papal theologians had been teaching and preaching for too long: Christ, yes, faith in Him, yes, but Christ plus something else: works. “We do our best and God does the rest.” No, we have not done our best and the Law shows us this. The Gospel, the Lord’s one work of universal (catholic) salvation in the life, death, resurrection and ascension of Jesus Christ means that the whole papal system of rosaries, pilgrimages, indulgences can not save one. Christ alone has, by grace alone known by Scripture alone in the life of His Church. Even the Law of God can not save (see Galatians 2:19, Galatians 2:21, Ephesians 2:6-8 ). The papal church knew Article IV meant the undoing of the system. When the papal theologians responded to the Augsburg Confession with their Confutation, then Melancthon wrote The Apology of the Augsburg Confession and Melancthon’s apologia (defense) of Article IV, Justification, was the longest. These two sentences summed up, not the faith of the Reformers, but the faith as taught, preached and written in the Bible. These two sentences undermined the institutional church’s hegemony on the lives of catholics/Christians with a system of works, obligatory works to gain salvation. 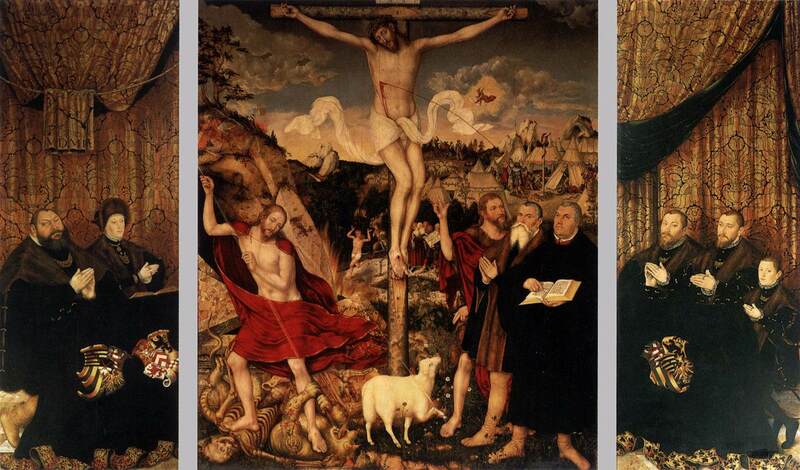 The Reformers presented on this day their Confession, based soundly upon the Scripture and the 3 Ecumenical Creeds (Apostles, Nicene and Athansasian), that salvation in Jesus Christ is sheer gift for sinners who can not attain heaven by anything we can ever do. The Fathers at Augsburg began this Confession of the catholic Church with the Creeds to demonstrate that Justification is the key of Scripture and had been taught and preached and administered since the Apostles through all the ensuing centuries, but lost and forgotten by the papal church. This lively iconographic image shows Word and Sacraments, the Preaching of Christ and Him crucified, freely given rein by the Word for the joy and edifying of Christ’s holy people for their faith and faith active in love. Lord God, heavenly Father, You preserved the teaching of the apostolic Church through the confession of the true faith at Augsburg. Continue to cast the bright beams of Your light upon Your Church that we, being instructed by the doctrine of the blessed apostles, may walk in the light of Your truth and finally attain to the light of everlasting life; through Jesus Christ, our Lord, who lives and reigns with You and the Holy Spirit, one God, now and forever. Amen.